2010 marks the bicentennial of John James Audubon’s arrival in Henderson. In commemoration of this occasion, the Friends of Audubon, Ohio Valley Art League and the Kentucky Department of Fish & Wildlife Resources are planning a full schedule of events for the year. To kick off the celebration, Audubon Museum will host the “Fowl Play” exhibit Jan. 22- Apr. 12. This exhibit will feature artworks of birds at play. 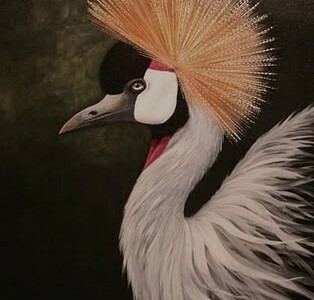 Artists, Jim List, Gary Bertram, Mary Lou Holt, Mark Heneisen, Iris Gentry, Lynn Buckman and Sherry Wilkerson will display realistic bird pieces; similar to the artwork that Audubon was renowned for. 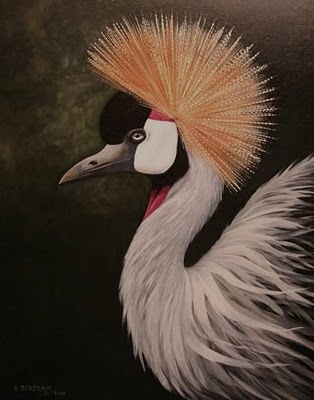 The painting above is “African Crowned Crane” by Gary Bertram. Henderson sparked a frontier spirit in Audubon, who roamed the woods, studying and painting the abundant species of migrating birds in the area. He grew as an artist during his years in Kentucky, and after his family’s departure from Henderson, he went on to publish his works in “The Birds of America” folio series. This exhibit will be open Thurs.-Sun. 9:00 a.m. – 4:00 p.m. during the months of January and February. During March, viewing hours are Wed. – Sun. 9:00 a.m. – 4:00 p.m.
Other events to look forward to during the celebration include a birdhouse contest, a reenactment of Audubon’s landing, a period costume contest, wildlife exhibits and much more. For more information on these and other bicentennial activities throughout the year, visit www.audubon2010.com. I remember standing out in the street in front of the old City Building in 1960 watching folks enjoying the festivities of the Sesquicentennial celebration on the streets of Henderson. I remember thinking, sheesh, the Bicentennial in 2010 is sure a long way off. I haven’t heard a word about it. Are we going to celebrate? Bicentennial for what? Kentucky? Henderson? The Audubon Bicentennial celebrates the 200th anniversary of Audubon’s landing in Henderson. As far as a celebration for the 200th anniversary of Henderson, Kentucky, (which is also this year) it is still in the works. However, the Tourist Commission is not part of the planning. We’ll let you know more information as we receive it. Look for events to come later in the year. We agree a celebration is needed, and think it’s wonderful that you remember the Sesquicentennial of Henderson!